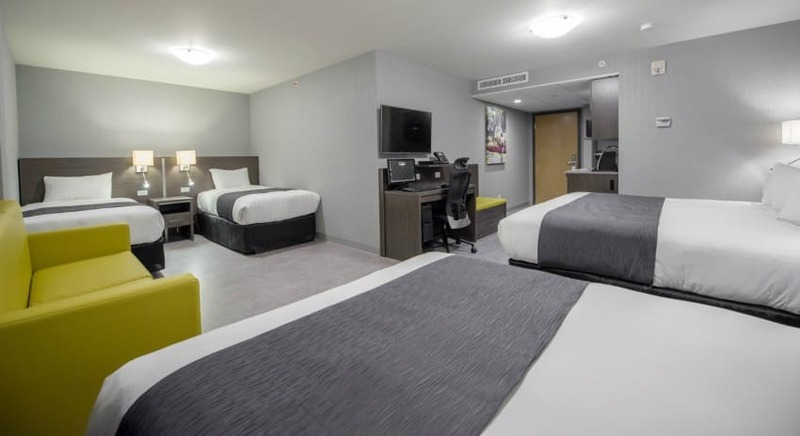 Hotel & Suites Le Dauphin Quebec offers a large 448-square-foot (42 square metre) family suite that is perfect for a stay in Quebec. This spacious, comfortable, functional Family Suite Distinction is equipped with everything you need to simplify your life. With its indoor pool and water play area, its games room and many other family amenities, the hotel will meet the expectations of the young ones among our guests! Learn more about our services, amenities and other family-oriented features on the Kids and Families page. Le Dauphin is your family hotel in Quebec city for a memorable stay with your family. Discover everything Le Dauphin Quebec’s Family Suite Distinction has to offer.